If you're trying to figure out what the cost of a concrete slab will be, you've found the right place. 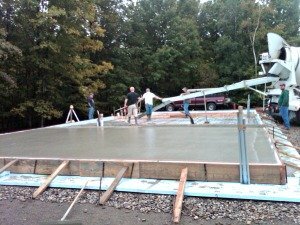 I've owned my own concrete company for over 30 years called Day's Concrete Floors, Inc. We install a lot of concrete slabs for houses and garages throughout the course of a year. There are many variables that come into play when figuring the cost of a concrete slab. I'll break them down for you below to help you estimate what a concrete slab might cost you. WHAT'S THE DIFFERENCE "CONCRETE SLAB VS CONCRETE FLOOR"? A concrete slab is poured right on a gravel pad and the edges are formed with 2x4's, 2x6's, 2x8's etc. A concrete floor is poured inside a concrete foundation, ICF walls, cement block walls, I think you get the idea. I'll tell you what I include and don't include in my concrete slab prices and give you an idea of what the "extra cost" is for some of the things that aren't included in the regular concrete slab cost. When trying to estimate the cost of a concrete slab, the first thing you should do is check with your local building codes. They might have specific guidelines you have to follow. Thinking of installing the slab yourself? Hey, if you're thinking of installing your own concrete slab then check out my training course. 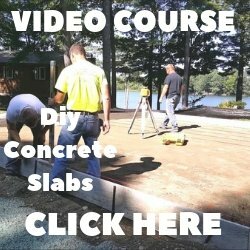 This video will teach you step by step how to do your own concrete slab. Check it out, it could save you hundreds of dollars!! I'll base my price on what my actual estimate would be to install a 6" thick concrete slab for one of my customers. Multiply the total square footage by 5 (dollars) to get the total price. L x W x $5.50 in this example. Those are the basic materials and labor included in the cost of a concrete slab. If your concrete slab is only 4" thick instead of 6" that will reduce the total slab cost by $.50 cents per square foot to $5.00 per sq. ft.
Any dirt work and grading of the sub-base would be an extra cost as would adding radiant heat to the concrete slab. Use these prices as a general guide only, always get three estimates from local concrete contractors to compare slab prices and remember to check references. I do anywhere between 50 - 100 concrete slabs per year, most all concrete slab estimates I do cost between the $5.50 to $9.50 per square foot as I have described above. 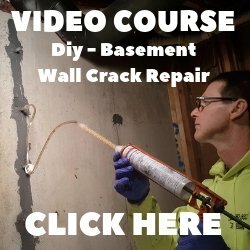 Remember to check with your local and state building codes, Maine requires a 12" thick edge and 2" of styrofoam under the slab, your state might be similar. 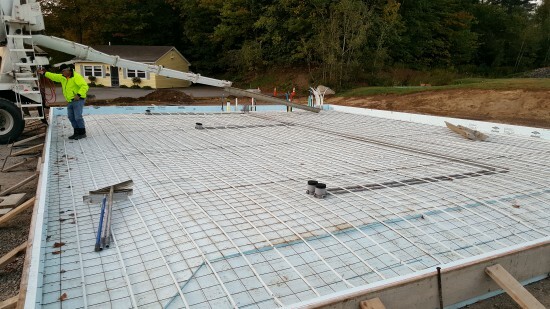 Concrete slab we formed and are ready to pour. This concrete slab we formed and are getting ready to pour is 50' x 40 x 6" thick with 12" thick edges. The cost for this slab was $9.00 per sq. ft. That price didn't include dirt work or radiant tubing installation. How much does a 30 x 30 concrete slab cost?